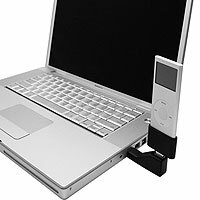 Make synchronization on your 2G iPod nano an easier task with the Incipio Hitch. This device connects to the standard, proprietary Apple synchronization and charge port on the nano, with the other end being a standard USB connector. This USB connector sitcks out at 90 degrees, making it a breeze to access crowded USB hubs. Too bad the Incipio Hitch comes in only black, white, and a limited edition Zebra color. Great for those who prefer not to deal with messy wires. The Incipio Hitch retails for $14.99 a pop.